Symptoms include a dull ache deep in the general area of the thigh. There is likely to be a pain when a bending force is applied to the femur, known as the hang test or possibly when the patient allows the thigh to hang over the edge of a bench or chair, particularly if weight is then applied downwards onto the thigh. Pain may be referred into the knee. An X-ray may or may not show up the stress fracture but a bone scan or MRI should give a more accurate diagnosis. What is a stress fracture of the femur? The femur bone is the long thigh bone. Prolonged overuse can cause a stress fracture. This is known as a femoral stress fracture. 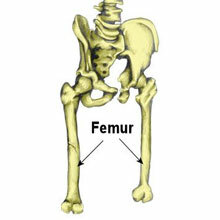 As with any bone, the Femur can also be fractured through one sudden force (see fractured femur). Rest is important, particularly resting from weight-bearing activities. Maintain fitness by swimming or cycling. Identification of any biomechanical problems such as overpronation which may have contributed to the stress on the femur. Depending on the severity it should take 7 weeks from the time that the ‘hang test’ (over the edge of the chair) is not painful before a gradual return to sports specific training can begin.